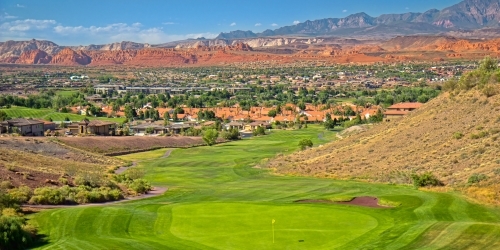 Sunbrook Golf Club located in St. George, Utah and is one of Southern Utah's finest golf courses. With 27 distinct holes this golf course is a favorite among fans of Southern Utah Golf. Multiple signature holes await you on any of the three nines; perhaps the most memorable hole is located on the Woodbridge nine. The par 3 fourth is not only daunting but one of the most spectacular holes in all of Southern Utah. This hole is a beautiful par three with elevated tees to a completely surrounded island green. Sunbrook Golf Club reserves the right to change price and offer at anytime. Prices and offer are subject to change without notice. GolfTrips.com is not responsible for errors posted in this golf package.